I was very recently at The Good Funeral Awards in Winchester and honoured to not only be nominated but WIN an award. The Award was for ‘Major Contribution to the Understanding of Death’ and was a statue of Anubis (Egyptian god of the Underworld and Embalming) in a cute cardboard coffin. 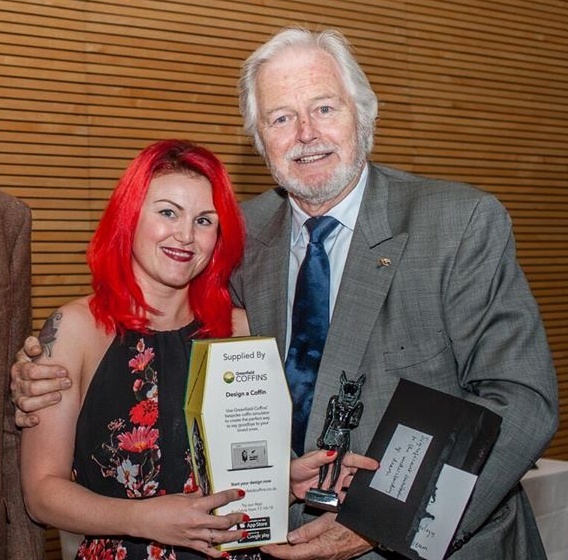 Ian Lavender from “Dad’s Army” presented me with the award! As a result of this I was interviewed by the Independent an ended up in the paper on Saturday 12th Sep and you can read the piece here. 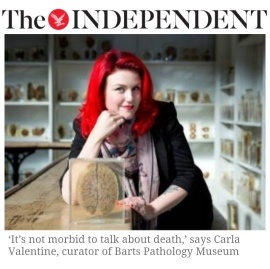 It was a lovely way to receive some acknowledgement and positive comments on the work I’ve been doing in addition to my full time job at Barts Pathology Museum. I thought the best way to say a big “thank-you” was to simply record a short video explaining the things I had been quite busy with and how your support means so much.